Colton Joseph (formally of Crosshill, Dromore, Co Tyrone) died peacefully surrounded by his loving family in The South West Acute Hospital on Monday 11th February 2019. Son of the late Hugh James and Marjorie. Brother of Adrian, Edwin and Stephen. Brother in-law of Carmel (Ferguson), Cathy (Keown)and Katherine (McGlone). Uncle to Niall, Dermot and Maeve. Wake strictly private. Joseph will leave his late residence at 6.15pm on Tuesday 12th February to arrive at St Davog’s Church Dromore for 7pm. 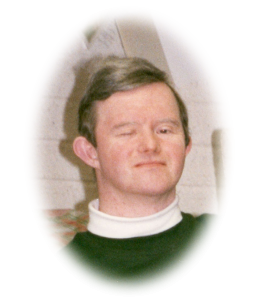 Joseph’s requiem mass will take place at 11am on Wednesday 13th February, followed by his burial in the adjoining cemetery Dromore. Deeply regretted by his loving brothers, sister’s in-law, his loving carer and friend Germaine, niece, nephews, and entire family circle. Sacred heart of Jesus have mercy on his soul. Please click on messages of condolence below to leave messages of sympathy in relation to Joseph and his family. To Adrain, Edwin, Stephen and families, Conor and I were very sorry to hear about Joseph’s death and that we were unable to be with you for his funeral. He was a very special person and was much loved by us all. May he Rest In Peace. Sincerest sympathy to all the Colton family circle. May he rest in peace after a lovely life. So very sorry to hear this sad news. May he rest in Peace.